One of the basic aspects in life-derived learning is to allow children discover the real world, through play. Because children, when given the power to choose, always transfer their play into reality. 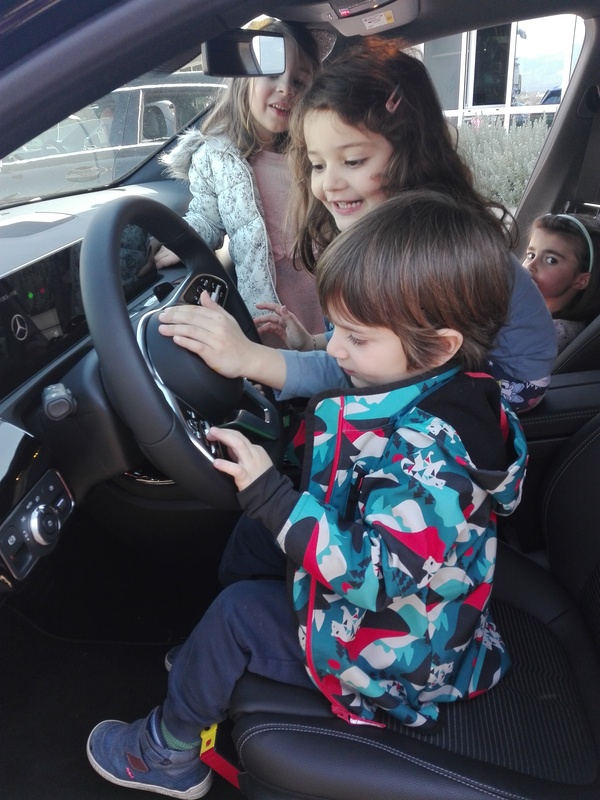 One of our pre-k classes developed a genuine interest on how cars work! They talked about cars, read about cars, saw movies, played with toys, even constructed fake cars in various forms . Unfortunately, in Greece we do not have a single car making factory. 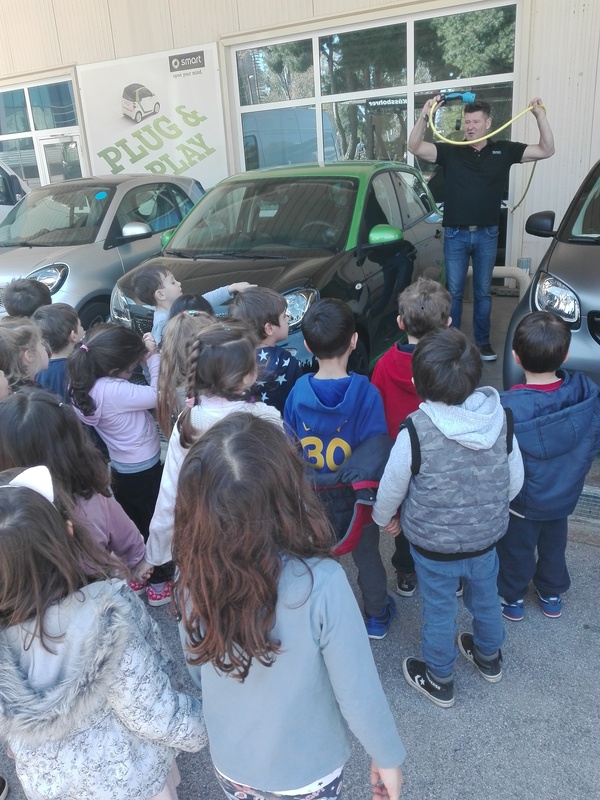 However, we do have many car import and repair companies and Mercedes Benz Hellas proved so willing to let our children visit their premises, ask questions and even play in their cars! Children came back in school full of enthusiasm. 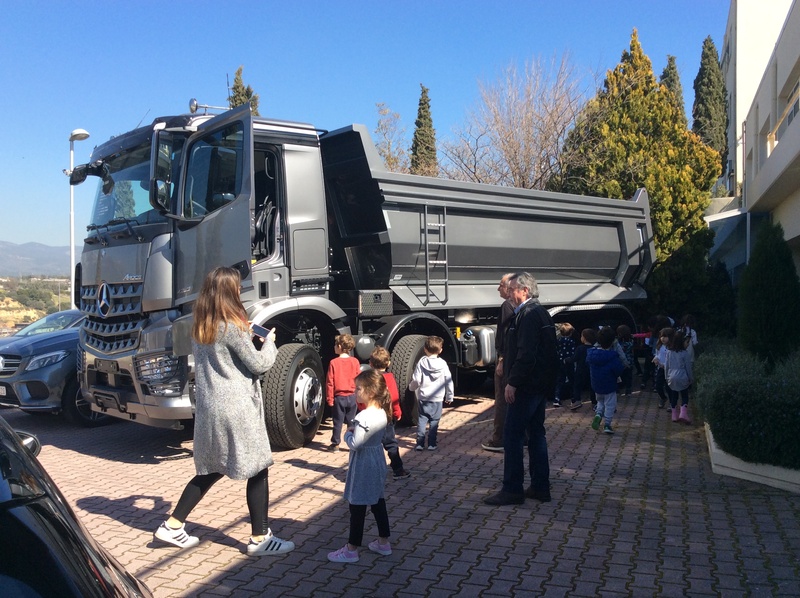 Because it is not what you learn in such a visit – it is how it makes you feel; and our pre-Ks returned in school feeling as great as any of us after having played in a Mercedes Benz! In school we talk a lot about the environment and the future of our planet. It is crucial to turn children caring & protecting, from very very early. 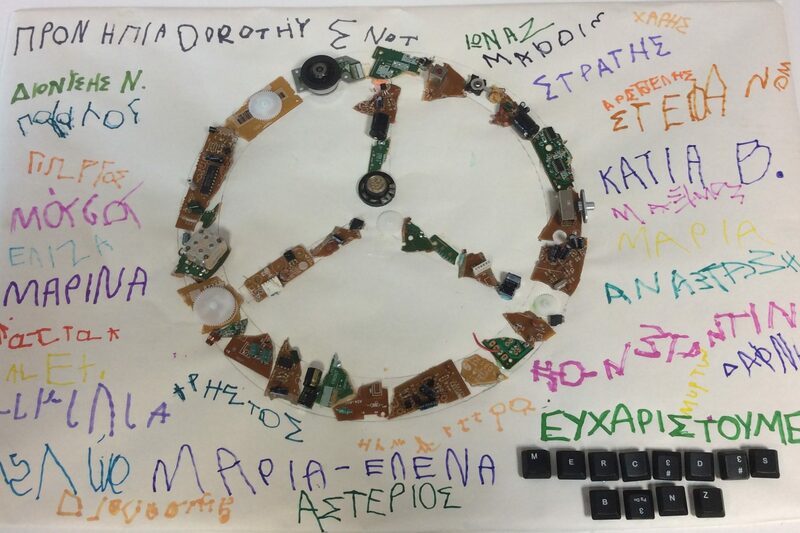 “Veronica” pre-K class entered this year a recycle & reuse project. 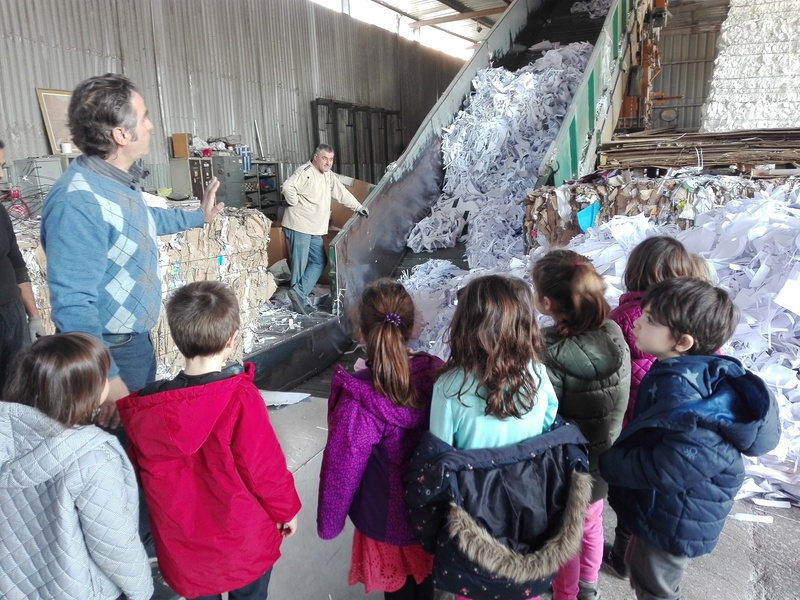 They visited, some months ago, DOANYS industry in Athens that recycles paper and learned all about it. 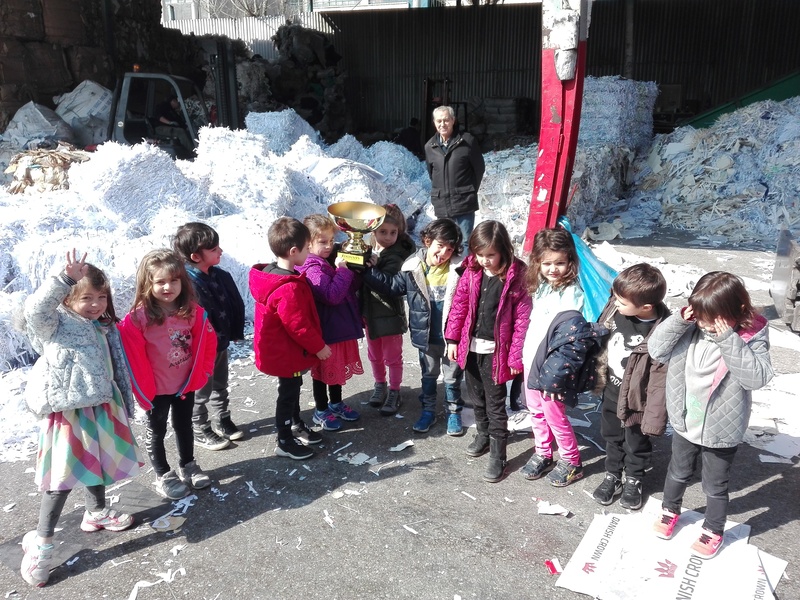 Returning to school, they decided to assume the responsibility of collecting the scrap paper from all classes. 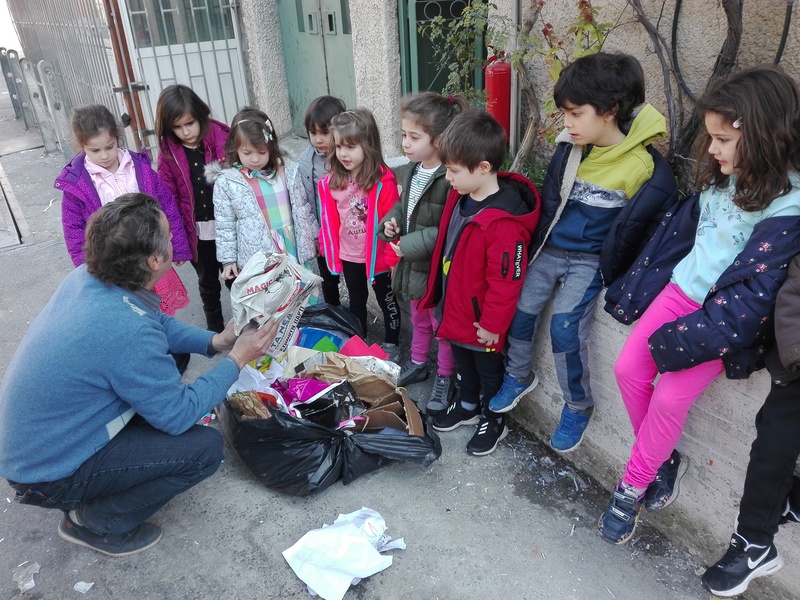 When gathered some bags of scrap, they visited again the same recycle factory. Delivered what they collected and attended, hands-on, their garbage turning into paper to reuse. Since they delivered a dozen of big bags, factory’s manager handed them the 1st recycling prize! Now, they will prepare for the Olympics…. Everyday, children bring in school questions and ideas arising from their own life. For example, they all have in home displays and other IT equipment but hardly ever have the chance to find out how do those things look, from inside. 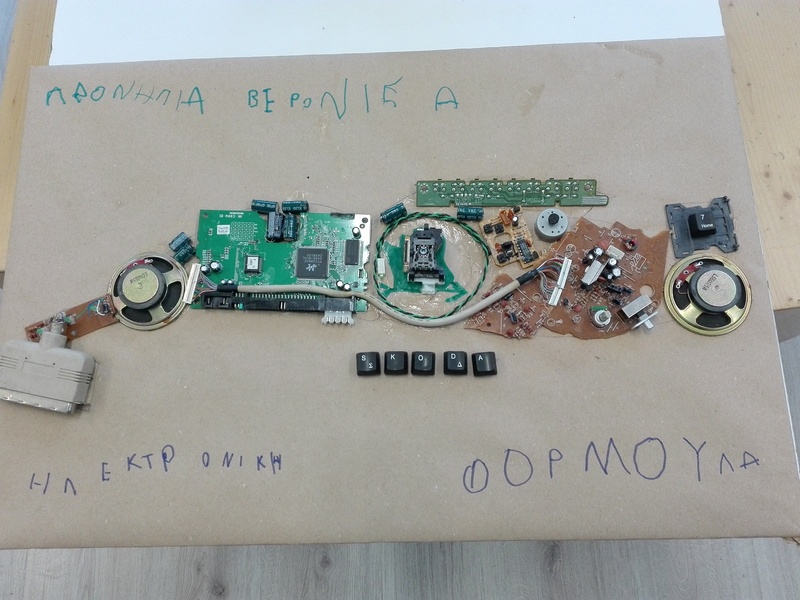 So, whenever this question comes in school, and the truth is it comes quite often, we just give them old pieces of HW and screwdrivers, to find out on their own. It’s always so much fun! 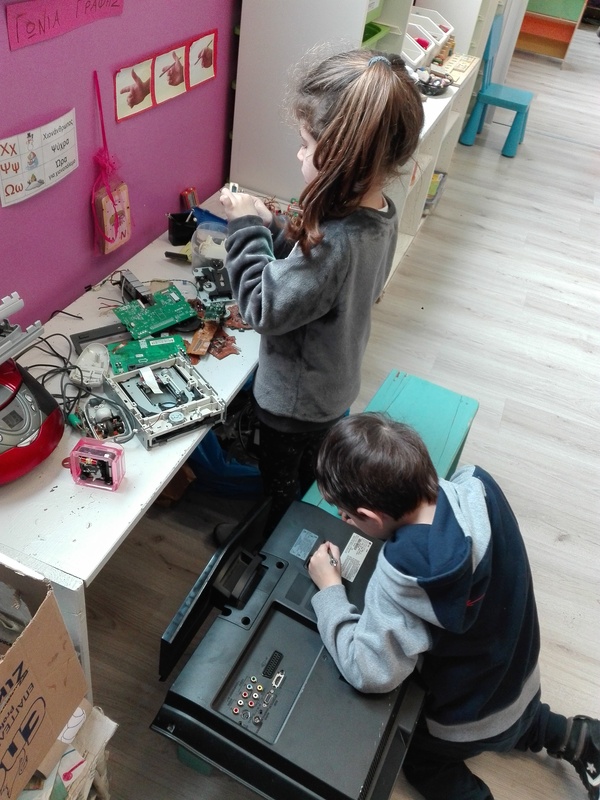 We do offer a DIY class in kindergarten, in order to introduce 6 y.o. children into creative thinking & problem solving attitude. While the above consist the most fascinating play, yet encourage children to develop numbers of skills and engage deeply into creative thinking and innovation. But most of all it’s just freely selected & non-directed play. Adults do not direct or impose, only inspire and facilitate. It’s not by coincidence that, when such a project is over, children rarely play with the outcome. They have enjoyed most playing during the construction! 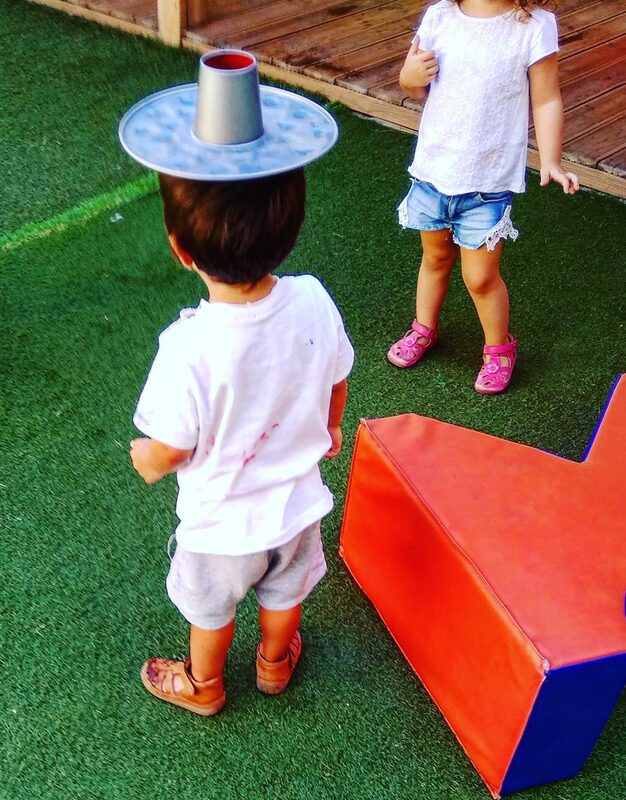 In a truly play-based environment, every single item can be transformed into a hat, a shoe, a wheel or a stool. That is why our spaces often look like junkyards! 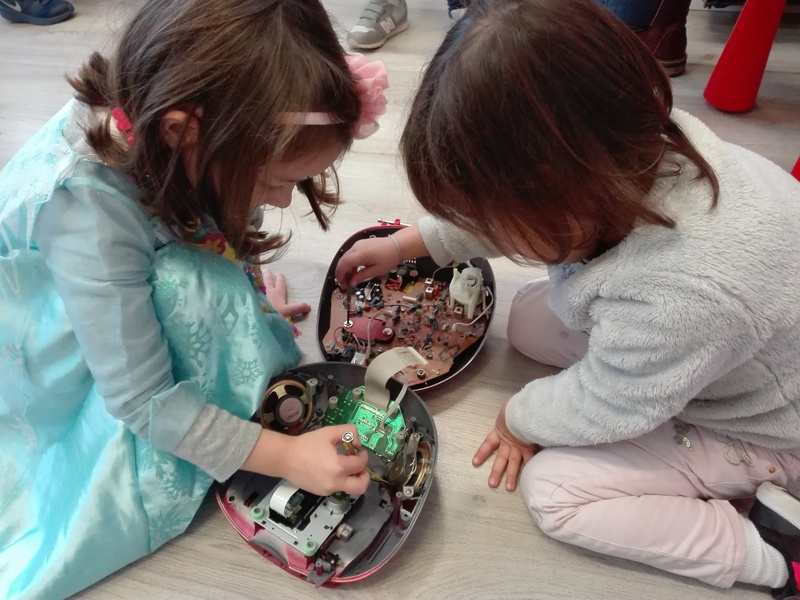 Children should feel completely free to engage into play with anything that exists around, no matter what it may be; so they imagine, innovate, combine, cooperate and develop independent thinking, on a free will basis. From my experience, at Dorothy Snot, I can truly say it is an exceptional school. From the first moment to the last, my time spent there was incredible. My first interaction with the school was my walk up to the building and seeing the bright and colorfully painted exterior giving it a feel of welcoming and warmth. Little did I know that the teachers and children would be just as, if not more, kind and welcoming. My entire classroom was filled with happy and active children. The joy contained by these children was in part due to the extraordinary effort put in by the teachers. I saw first hand the work they put into making the days for the children not only fun but an effective and creative way of learning. The time these teachers spend with the children in school is only half the energy they put into making the school days a good time. They spend a lot of their time out of school preparing lessons and activities for the children. 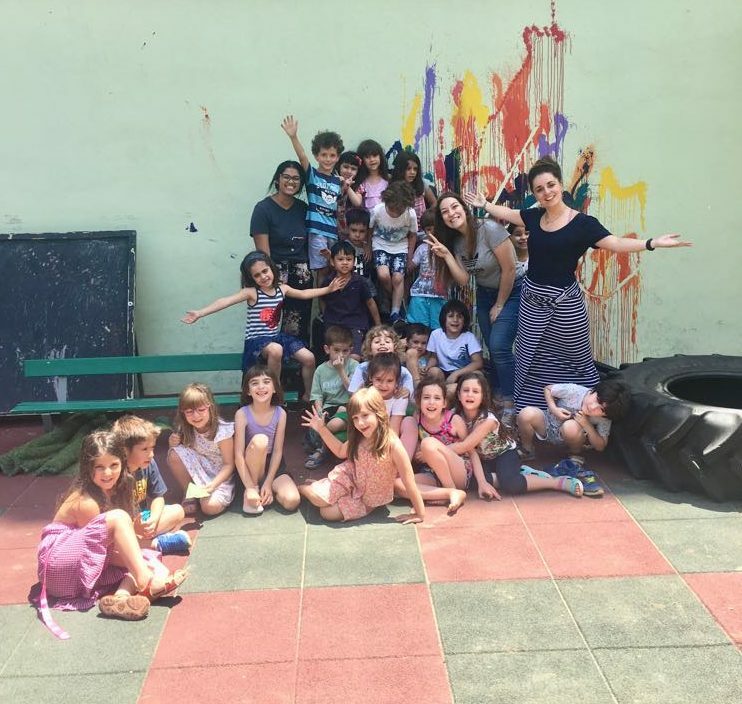 The school is known for its “play-based” learning, which is a great way for children to absorb as much material as well as expel all the pent-up energy in them. From reading & writing to yoga and outdoor education, the children have a vast amount of opportunities to learn. The school offers multiple different classes from English to Art, to Outdoor Education. The students are grouped off into their respective classes where they are able to participate in the class and then rotate into another class. This allows the children to interact with the teachers more, thus giving more attention to them, which is always a positive for younger children. Following these lessons, the children are involved in a free play which allows them to be creative while also subconsciously discovering more about their selves. Overall, the school is designed and includes teachers that allow the children to grow up to be well rounded and kind individuals.